The DDMworks MINI Cooper S Cold Air Intake for the R52 and R53 MINI Cooper S is the best intake for your MINI. 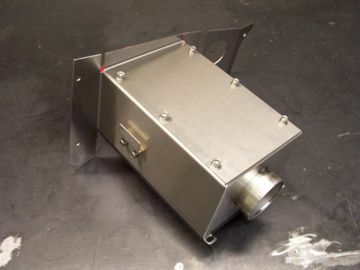 It works by sealing a UNI dual stage filter inside a stainless steel enclosed box. The unique design keeps engine heat from getting to the filter, while the stainless steel gives the intake the highest resistance to heat transfer when compared to other intakes on the market. 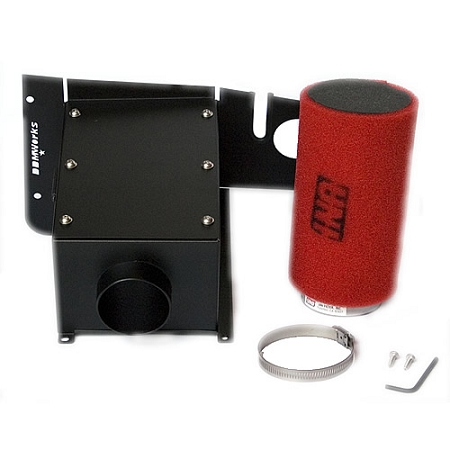 The UNI dual stage foam filter can be re-used and re-oiled and provides a lifetime of service on your MINI. 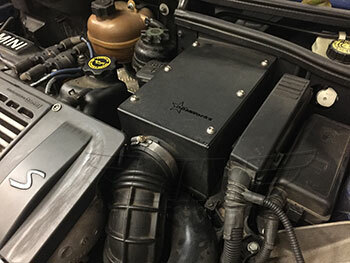 The filter is over sized to give plenty of filtering capacity without sacrificing air flow on the supercharged MINI S. The DDMworks intake is unique, providing the enclosed filter with pressurized, cold air from the cowl area beneath the windshield, without requiring you to cut any of your factory parts, allowing your car to be returned completely to stock if needed. With simple hand tools the intake can quickly be installed on your car, allowing you more time to go enjoy the ride! Also available in Black. Intake hose option is only available for Manual transmission cars. Made in the USA. mounting hardware NOW you have the option to get the Uni Foam filter or K&N filter. WMW recommends the Foam. This was the first mod to my R53. Best way to start mods: get your engine to breathe more efficiently! Installation took me (MINImal mechanic experience) about an hour to install. Love the hiss and swoosh sounds and the supercharger is so much louder! One thing that many people like about the R53 is the sound of the supercharger whine. This intake made my supercharger WHINE. It was easy to install and the car can be brought back to stock easily. No cutting or modifying under the bonnet. Picked up more power. Great Sound. Best engineered CAI I have seen for the R53. This is the CAI you should buy. Great sound. Stainless steel looks great as well. Easy to install, excellent fit, great sound, and easy to maintain! Just got my DDM intake, great quality and finish. Installation took me 15 minutes and everything fits perfect When to test the car and all I can said is AWESOME. I'm going to spend more money in gas cuz I love the sound. Bought this for my 08 R52 30k miles ago and still happy with it. Easy install and immediate smile as you really hear that supercharger whine! Awesome. Love the supercharger sound. Used a large wood clamp to make the lid re-install process a little easier. Highly. Recommended. This makes your engine bay look great...especially if you get the stainless steel version. However, I wish they made a version that would dissipate heat easier. Having said that, this is the BEST sounding Cold Air Intake for the r53 MINIS...hands down! I must say I love everything about this intake as far as looks, power, and sound are concerned. However the install wasn't the smoothest, for some reason my air box was a little bent if you could call it that so I had to straighten it back out because it would not line up with lower intake box. Also had to remove rubber tab where the battery post hooks because the post would not stretch so it could slide on. Once I removed the rubber tab I was able to get it to go on but I mean barely. And the stock intake tube is a BEAR to get on to the new intake box, I had to use lots of vaseline and heat the tube and was able to get in on then. Really this is no way bashing Way as it's possible the intake box was damaged in shipping. Still give it 4 out of 5 stars because once on it's worth all the headache of the install. Install takes about an hour or so, and once its installed the sound is exceptionally more pronounced than stock. This is a great and cost effective mod. My supercharger whine is soo much more louder now. Love it! I have the stock hose going from the CAI to the throttle body and it is a pain to to put it back on the CAI. The hole is too big and you have to be very patient with installing it if you are not using a heat gun.